Our alumni do amazing things. 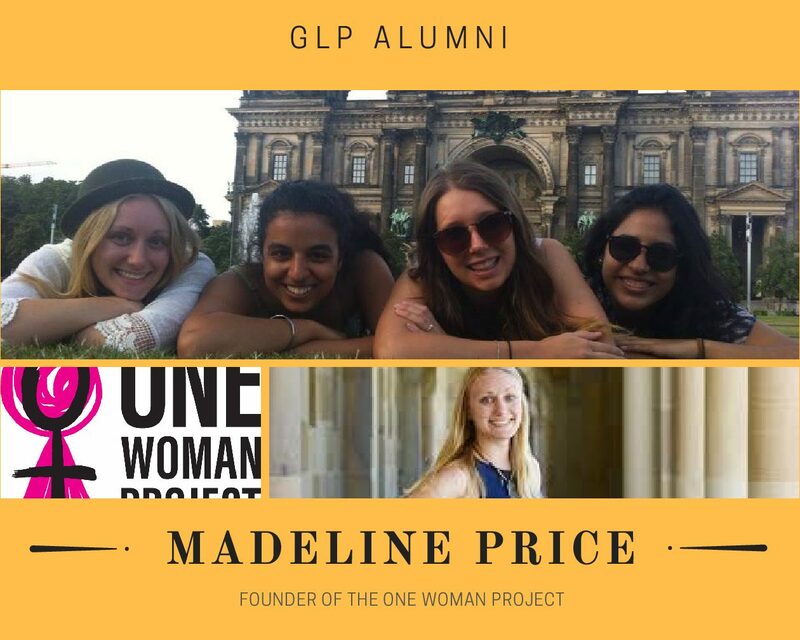 I sat down with GLP Prague program alumni, female founder of the One Woman Project and native Australian, Madeline Price to talk about the role Leadership exCHANGE played in helping her bring her dream to fruition. It was an idea that had been floating around in my head for quite some time. If we can educate young people about issues of global gender equality, if we can provide them the skills and training to take action in their communities, then we might actually be able to do something about it. It grew from this old Aid and Development adage, that if we can educate someone in Cambodia then they can change their entire community. I wanted to stretch this to encompass our young people in Australia. If we can educate someone in Brisbane, or Imbil, or Cairns, in gender equality, they can change their community. The One Woman Project falls under the category of social entrepreneurship. According to the Schwab Foundation, is Social entrepreneurs drive social innovation and transformation in various fields including education, health, environment and enterprise development. They pursue poverty alleviation goals with entrepreneurial zeal, business methods and the courage to innovate and overcome traditional practices. A social entrepreneur, similar to a business entrepreneur, builds strong and sustainable organizations, which are either set up as not-for-profits or companies. Find more info here. EW: how did you know you wanted to pursue this idea? MP: It was not until I commenced the Global Leadership Program in Prague that I really got the boost to make this idea a reality. The idea had been floating in my head for quite some time, but I had never shared it with anyone. I had never written it down, or devised a program plan, or pitched it. Having the freedom to develop this idea and the skills to put pen to paper (and eventually pitch it to my peers as part of GLP) was the push I needed. From that point, once I had shared it, the logical next step was to put it into action. EW: how did GLP equip you with the skills to then actually follow through? MP: The biggest support that GLP provided me with (other than giving me the courage to pitch and share my idea) was the networks I created within the program to make my idea a reality. Peers I met, the academics I engaged with, and the support from the GLP staff made a massive difference when I went back to Australia. Reaching out to other students who were on the program to ask about the biggest issues of gender inequality in their home countries when I was developing our curriculum was crucial. I was connected with other gender-focused organizations by the GLP staff. I had the opportunity to ask the academics we engaged with intricate details about growing businesses, human rights and educational programs. These networks were invaluable in the startup stages of the organization. EW: how do you think GLP set you apart from your other graduates or peers [in thought process, experiences, value systems at work? MP: GLP is an entirely different program to the typical ‘study abroad’ experience. It gave me enterprising skills – skills in public speaking and pitching, in cross-cultural communication, in networking and engagement, and in leadership. You do not typically receive from the more traditional ‘study abroad’ model. These skills are transferable across jobs and industries. They have been more valuable to me in the world of work than the technical skills that make you suitable for a particular job in a particular industry. The skills you receive within GLP prepares you for a world of work that doesn’t even exist yet. MP: When I think of my time in Prague on the Global Leadership Program, one memory sticks out above the rest. We spent a morning collaboratively painting murals on the John Lennon Wall. Our small group discussed and debated for quite some time on what we wanted to paint. Would we focus upon something that empowered women (as we happened to be a group of active, empowered women), would we write a quote, would we draw a detailed image? We ‘ummed’ and ‘aahed’ for quite a while before one group member asked? What embodied our GLP experience to that point? The answer in some way, shape or form, from every group member could be boiled down to one word: opportunity. Our mural would be thanking those who got us here – our friends, family, GLP staff, supporters, teachers and, of course, ourselves – for the opportunity to create change in our communities. This opportunity that gave us so much. Learn more about Madeline and her project at One Woman Project here.